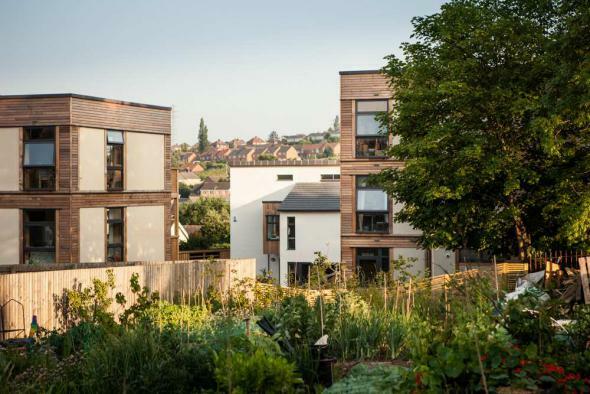 LILAC, a housing co-op located in Leeds, England is a good case study not only of a different model of co-op housing as well as sustainable technology and practices. David Rodgers, former president of CHI and current London Borough of Ealing councillor, has been involved in the Mutual Home Ownership model on which LILAC is based. It is UK’s first affordable ecological co-housing project built using straw bale technology. 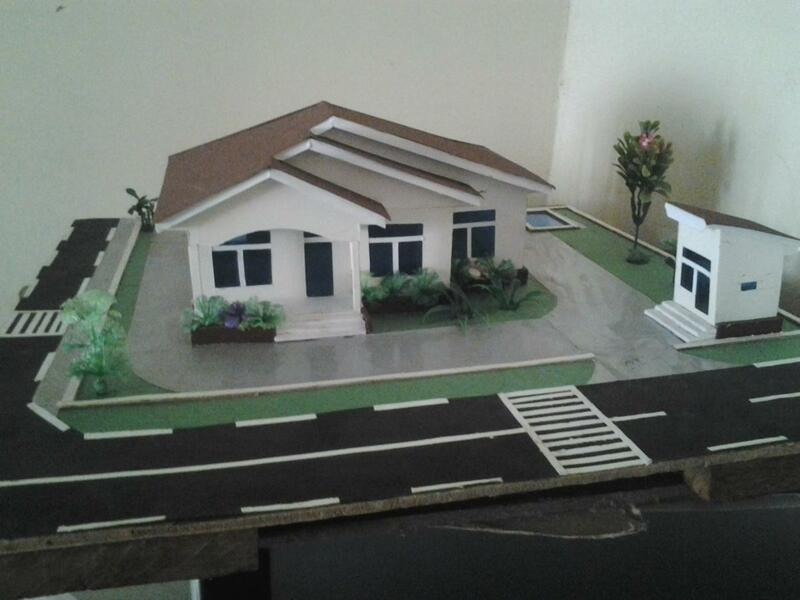 LILAC (Low Impact Living Affordable Community) adopted a ‘mutual home ownership scheme’ (MHO). Buying a house in the UK has become almost out of reach for most people over the last decade. In response, LILAC is pioneering a new affordability model in the form of a MHO which is an equity based leaseholder scheme and a new way of owning a stake in the housing market. Mutual Home Ownership is a different way of looking at home ownership. It is designed to deal with the rising unaffordability of housing. Its starting point is to stop treating housing as a long-term capital investment with owners/residents hoping to make substantial returns on their investment and instead to see housing in functional terms – where the value lies in the use and the use attracts a cost. Residents of a MHO Society own shares in the mutually owned property trust and contribute to the repayments on the collective mortgage. The cost of the project is divided into equity shares. The number of shares they own and the payments they make are related to their income. After some deductions, members can take their equity with them on leaving. LILAC is also committed to tackling climate change and reducing the environmental impact of their neighbourhood. They are not just striving to be “carbon neutral” but also to be “carbon negative”, i.e. returning more power than the co-op uses to the national grid. The co-housing community used locally sourced building materials – the walls are made from insulated straw bale and timber panels, pre-fabricated in Modcell’s local ‘Flying Factory’. Modcell is a super-insulated, pre-fabricated building system made from renewable carbon-catching materials. In contrast to a conventionally built home which produces around 50 tonnes of CO2 during its construction, a home built using straw bale as insulation can actually store 12.25 tonnes of CO2! This innovative, offsite-manufactured wall and roof cladding system is quickly and efficiently installed, creating buildings with thermal performance up to three times higher than the current building regulations require. The ModCell® system utilises the excellent thermal insulation qualities of straw bale and hemp construction to form prefabricated panels. The buildings use ‘passive solar’ design, which means that the insulating materials and design of the buildings combine to store solar heat in the winter and reject solar heat in the summer, thus reducing the need to input heating energy. Residents are also working together to lessen their environmental impact through car sharing; pooling resources and tools; growing food on their allotments and looking to the local area to provide as many needs as possible. The design of LILAC mixes private dwellings and shared facilities. LILAC is home to 36 adults and 12 kids. The common house includes shared kitchen and dining facilities where members have dinner together twice a week, laundry, a multi-purpose room for cinema nights, yoga lessons, a guest room for overnight guests and a workshop with bike tools and other equipment. The site design is based around a car-free home zone, communal gardens, beautiful green spaces, areas for growing food and ample cycle storage. There is limited on-site parking (which had to be negotiated with planners) since residents share cars. There is also a shared office with a computer, printer and scanner. A webinar recording is available that tells us how the LILAC community in Leeds came into being. You can watch it here. If you’re interested in reading more about the development of this project you can order a copy of the book – Low Impact Living: a Field Guide to Ecological, Affordable Community Building, by Paul Chatterton, co-founder of LILAC. The book is a story of perseverance, vision and passion, demonstrating how ordinary people can build their own affordable, ecological community. If you want to know more about Mutual Home Ownership read this consumer’s guide produced by the CDS Co-operatives in the UK. LILAC, who is celebrating their second year anniversary was voted second in The Guardian’s Top Eco Homes in the UK among other awards such as a British Social Enterprise Award. Both The Guardian and The Sunday Times wrote articles about this innovative community. In contrast with the previous story on LILAC in Leeds, this story is about a fledgeling co-op in the Democratic Republic of Congo (DRC) called SolidBatir. It all started a few months ago with an email to CHI from Doudou Mirefu, SolidBatir’s director, asking for guidance. They are creating an affordable alternative to the poorly built housing that exists in their area. The only co-ops that exist in the RDC are credit and savings co-operatives so they are the only active housing co-op in the country. The co-operative formula was chosen as it seems the most economical and most feasible given the challenges of dealing with state agencies. SolidBatir has already acquired and distributed 160 plots to members. Construction of the first 120 houses for members is the next step. The housing co-operative has more than 150 members, 80% of which work in public enterprises and in other services. The remaining 20% are traders, education workers or work in the private sector. 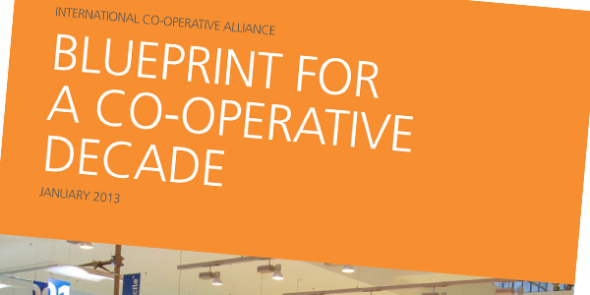 The intention of the Blueprint, as adopted by the Alliance General Assembly, is to mark the beginning of a worldwide campaign to “take the co-operative way of doing business to a new level”. The five key elements of the Blueprint are participation, sustainability, identity, legal frameworks and capital. Clearly, the Blueprint has resonance for all forms of co-operatives. What particular relevance does it have for co-operative housing? Unlike other forms of consumer co-operative (of which housing co-operatives are a particular form), housing co-op members patronise their co-ops on a continuing, daily basis. The opportunities for member engagement in the democratic and community life of the co-op are therefore much more readily available. as fully as possible without over-taxing the members’ time and attention. Read the full article online (in English).